The graceful main square of Cusco, the Plaza de Armas, is lined with colonial-style covered walkways and houses that contain souvenir shops, restaurants, bars, and travel agencies. The large cathedral is the most prominent structure overlooking the square and is adjoined to a church on either side, the Iglesia Jesus María and Iglesia El Triunfo. Inside is the elaborately carved wooden altar, covered in gold and silver plate, and the carved wooden choir stalls that are acclaimed to be the finest in the country. Also of interest is the painting The Last Supper, which portrays Jesus and his disciples gathered around the table, on which a central platter of the local Inca delicacy, cuy (roasted guinea pig), is placed. Also on the plaza is La Compañía, one of Cuzco's most ornately decorated churches, often floodlit at night. The streets and alleys around the plaza are filled with colour and bustling handicraft stalls. The historic pedestrian alleyway of Loreto, leading away from the plaza, is lined with Incan stone walls. 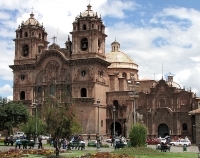 The plaza tends to be the starting point for tourists in Cusco, and is the most prominent landmark of the town. Most South American cities have these central squares, but Cusco's is one of the finest.